30 x 20 x 5 cm, silkscreen on cloth inside a hand-painted frame. A play on perspective and a point of view. There are other variations of this work, also white ink on black cloth. Een ironisch en speels perspectief (de walvis van Jonas). Er zijn ook andere variaties op dit werk, ook zeefdruk op zwart doek. A full list of printmaking by Sonja van Kerkhoff, 1989 - 2004. Conservations, 2005, printed drawings on transparency. Letters of the Living, 1996, lithograph in circle form. 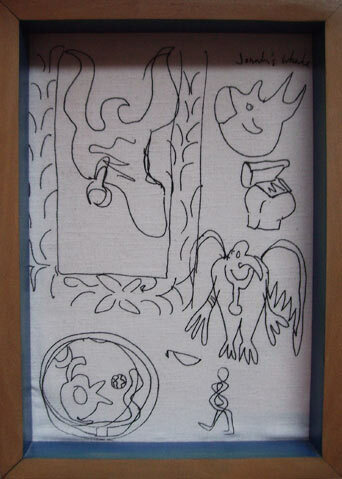 The Essences and Particularities Series, 1995 -, mostly drawings.